Grimm has had an up and down second season thus far, pitching wildly from promising to disappointing and offering glimpses of a more cohesive main cast and reliable plot arc. “Over My Dead Body” falls on the positive side of the list for me, but not completely, since among many elements that worked—Hank slipping into a bit of a less-quippy Xander role as he questions Monroe, sparing use of Juliette and Renard, and a surprisingly resonant death and final scene—there are still some logistical issues that gum up the works and prevent it from progressing to something more than just above-average for Grimm. My biggest problem with an episode like “Over My Dead Body” is how it separates Nick and Hank from their police work entirely. This is something woven into the fabric of the show, that Nick is forced to live a double life, but unlike Buffy’s life as a student, he has to hold down a regular job. Being a detective makes sense, but dividing his life so easily, and only delving into his cases with Hank when they deal with Wesen crimes by happenstance, is the weak choice here. The best episodes of Grimm—I’ll cite “Organ Grinder” and “The Three Bad Wolves” as two examples—put Nick in the rough position of investigating a case from the legal perspective as a detective and from an educational perspective as a Grimm, and the blend made for something compelling as a window into this new world. That dichotomy was an issue in the first season because Nick was constantly juggling relationships where he had to go between the façade of a detective and the actuality of a Grimm. He could only be himself with Monroe, but now that Hank knows about the world—and seems to be actively trying to learn about what Nick sees and deals with—the only core relationship Nick is still hiding in is Juliette, and that dynamic has changed considerably from the majority of last season. I know this is an overarching critique on the framework of this episode, but it’s still bothersome when it’s unclear what Grimm wants to be. Since it premiered, there has always been a plethora of directions for the show to go in, but it’s still stuck wandering down and back one road, then another, never committing to any of them. I bring up “The Three Bad Wolves” because the important guest role in that episode was Angelina, Monroe’s Blutbad ex-girlfriend from before he reformed his ways. She shows up again in “Over My Dead Body” drifting around a couple hours away from Portland, forced to kill another Wesen trying to force himself on her in the parking lot of a bar. Unfortunately, that Wesen had been hired to do a job for some scary-looking snake Wesen (honestly, your best guess on how to spell the name of the creature is as good as mine. Koenigslange? You got me). The job is a hit, and the target is Monroe, to send a message to any other Wesen in Portland that getting friendly with a Grimm won’t be tolerated. As Angelina gets this information, Grimm cuts between two rather nice romantic dinners, one between Nick and Juliette, the other with Monroe and Rosalee. They’re both surprisingly tender and delightful moments, as Nick retells the story of how he and Juliette met, while Rosalee and Monroe gush about their favorite Austrian zitherist—which is just insanely adorable. Angelina kicks in Monroe’s door and messes that all up, intruding on his date with Rosalee (who ditches quickly, then skirts off to her dying aunt, in one of the more obvious “I’m pregnant, so I won’t be around for awhile” moves I’ve seen in long time), which kickstarts the off-the-books investigation. This involves hiding Monroe at Hank’s place as a safe house and Angelina teaming up with Nick, who isn’t too happy at the prospect of allying with someone who clearly murdered some Bauerswine last season (man, this show’s mythology leads to some sentences that are laughably ridiculous out of context). But Nick and Hank set all of that aside in order to help Monroe. If there’s one good thing to take away from “Over My Dead Body,” it’s that when the show brings all of its main characters together on a case, they’ve developed great chemistry. Nick, Hank, Monroe, and Rosalee work off each other well, and Angelina is a nice firecracker addition for one week, pretending to be Nick’s partner and doing some recon work with the snake Wesen’s henchman to find out that the job has been filtered through him as a middleman. The real goal—scaring Wesen away from being friendly to Nick—has something to do with a royal. Nick suspects it, and tells Hank/Monroe/Angelina he’s heard about that development, since it came from his mother after she killed Adalind’s mom. Spliced around this main plot, which weaves together the new Scoobies—group nickname ideas?—plus amnesiac Juliette and a guest star, is Renard’s rendezvous with a mysterious blonde woman (he seems to run into that type a lot, especially with Adalind returning next week). She’s a royal as well, just back from strong-arming an organization known as “The Dragon’s Tongue” in Tokyo, and she sympathizes with Renard’s predicament ostracized from his family, presumably after some incident in Vienna. But it isn’t all friendly, since she tries to send Renard to her hotel room after she leaves her room and files a flight plan for her private jet waiting on a tarmac. 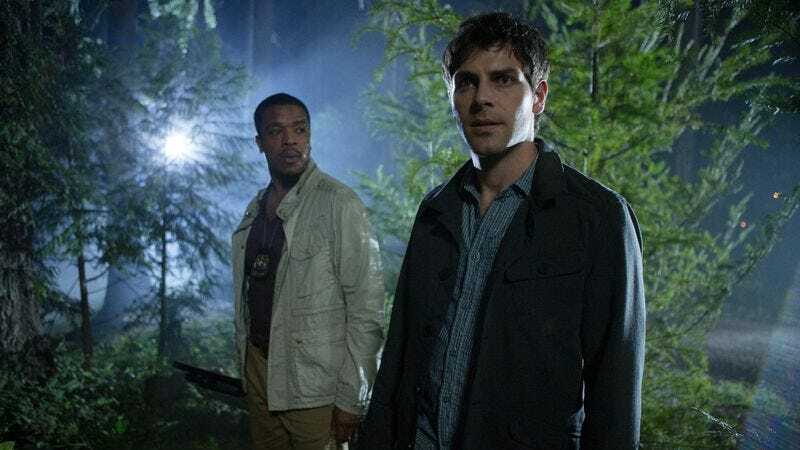 There haven’t been many tender emotional moments during this first season-plus of Grimm, but the final scenes, with Monroe’s burial ritual and long howl into the wilderness, is one that will stick around. I doubt he’ll be hung up on her, but as the most popular character on the show, his display of grief lands. This is the first resonant death on Grimm so far, the first that will linger for more than just the completion of an episodic plot. In that regard, the show takes another small step toward getting better. 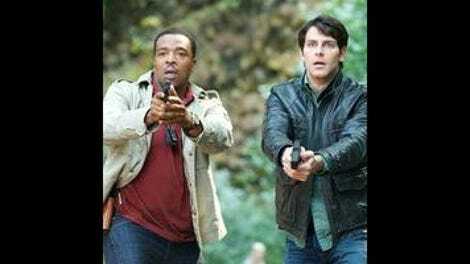 Packing an emotional punch with meaningful characters is a sign of moving up in the genre world, but Grimm hasn’t figured out a way to use that in conjunction with its many disparate approaches to the mythology of the show. Tonight’s epigraph comes from the Grimm’s tale “The Three Snake-Leaves,” which is an entertaining little story, but it has absolutely nothing to do with the episode. It’s as though the producers devised the plot, then looked for some applicable folk tale, then designated that one cobra Wesen. The plot of the tale is actually heartbreaking. Use that! According to the paper the snake Wesen gives Angelina, Monroe drives a 1974 VW Bug, and his address does correspond to an actual location in Portland. Crucial details! Seriously, the Monroe/Rosalee date is adorable. The candles, Monroe cooking, the soundtrack. All of it, and Angelina ruins it right at the perfect moment. Renard makes it to the blond woman’s private jet on the tarmac and intercepts her before she can leave, hoping to wean a bunch of information out of her about why she tried to give him the slip. Will Angelina’s brother make another reappearance? He was a funny guy, might be worth it to see him with Monroe again. Oh wait, isn't he dead? Only Angelina sticks out in my mind.